Even as the Obama administration struggles to deal with the situation, including finding adequate shelter and protection for the kids, some in Congress have attempted to score political points by arguing that the increased numbers are the result of the administration’s own immigration enforcement policies, such as the creation of the Deferred Action for Childhood Arrivals, or DACA, program in 2012, which grants eligible unauthorized youth a two-year reprieve from deportation and a work permit. Rep. Darrell Issa (R-CA), for example, called on President Barack Obama to end the DACA program and begin deporting those with the status to send a message to prospective child refugees that they should not come to the United States. However, a close statistical evaluation of the available data suggests a very different dynamic that is leading children to leave their Central American homes. It is not U.S. policy but rather violence and the desire to find safety that is the impetus for these children’s journeys. Violence is among of the main drivers causing the increase. Whereas Central American countries that are experiencing high levels of violence have seen thousands of children flee, others with lower levels of violence are not facing the same outflow. By contrast, the evidence does not support the argument that DACA or lax border enforcement has caused the increase in children fleeing to the United States. How can it be determined that violence is a primary factor causing children to flee? One way is to use the U.N. Office on Drugs and Crime, or UNODC, data on homicides and homicide rates by country. Coupling this data with that of the number of children arriving each year allows us to examine the relationship between violence and children arrivals. Figure 1 shows how violence affects the flow of children. The relationship is positive, meaning that higher rates of homicide in countries such as Honduras, El Salvador, and Guatemala are related to greater numbers of children fleeing to the United States. Another way to examine the relationship between violence and unaccompanied children is to use the data on security levels in Latin America compiled by FTI Consulting, a global business advisory firm headquartered in Washington, D.C. The annual index ranges from 1 (safe) to 5 (very dangerous) for each country, and data are available from 2009 to 2014. 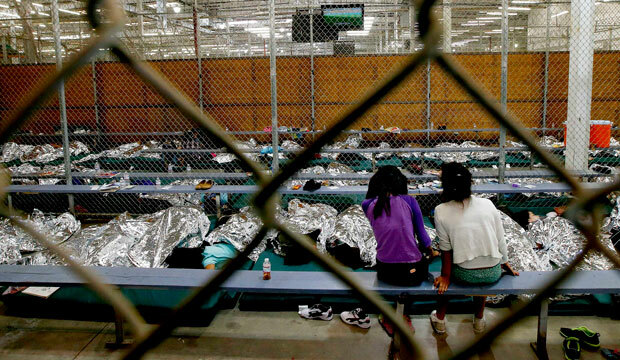 Here again, the relationship is positive, meaning that more dangerous security conditions are related to greater numbers of unaccompanied children. Using the FTI Consulting index data provides an even more strongly statistically significant result, suggesting an even clearer link between violence and children fleeing. 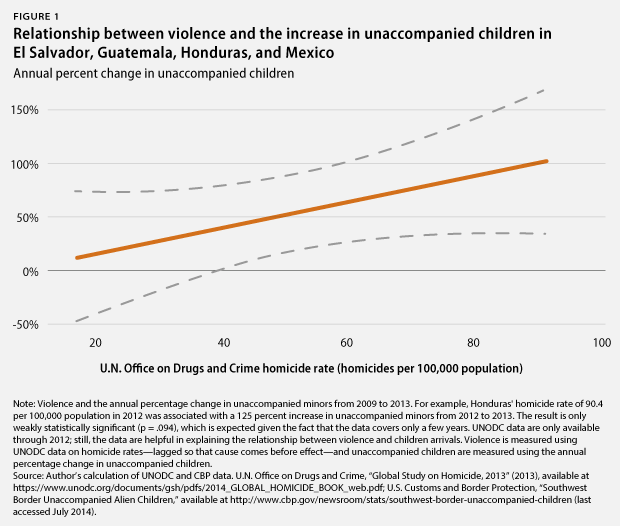 Not only do countries with the highest rates of homicide have the largest numbers of unaccompanied children fleeing, but the data also make clear that countries in Latin America with lower rates of homicide are not sending large numbers of unaccompanied children. In 2012, the countries of El Salvador, Guatemala, Honduras, and Mexico accounted for 41,828 homicides, at a rate of 28 per 100,000 people. Exclude Mexico and the murder rate jumps to 54 per 100,000 people. The president of Honduras has gone as far as calling the children refugees from “war” in his country. By contrast, other countries in the region, such as Belize, Costa Rica, Nicaragua, and Panama had a total of just 1,881 murders, at a rate of only 13 per 100,000. Nicaragua is particularly useful as an example: It is the second-poorest country in the region—behind only Haiti—and yet, with far lower rates of violence than the three main sending countries, it has not seen an uptick in unaccompanied children leaving. These findings reinforce a report released by DHS that shows that many of the unaccompanied minors who have recently arrived come from some of the most dangerous cities in Central America. There are two problems with this line of thinking. 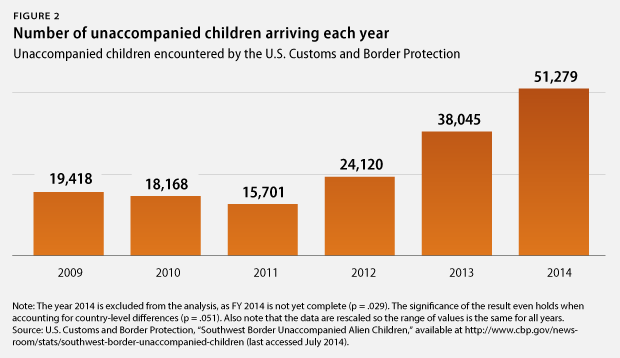 For one, the increase in unaccompanied children began well before 2012. CBP estimates that between 2008 and 2009, for example, there was a 145 percent spike in unaccompanied children arrivals, jumping from 8,041 to 19,668. But even more importantly, the U.S. fiscal year starts on October 1 and ends on September 30 of the following year. This means that FY 2012 actually started in October 2011 and ended in September 2012. Considering that applications for deferred action could only be submitted starting on August 15, 2012, it is highly unlikely that DACA caused an increase in children. Data on monthly border apprehensions—which admittedly do not distinguish between unaccompanied children and all others caught at the border—show that the number of people caught at the border actually slowed in the months after DACA was announced. 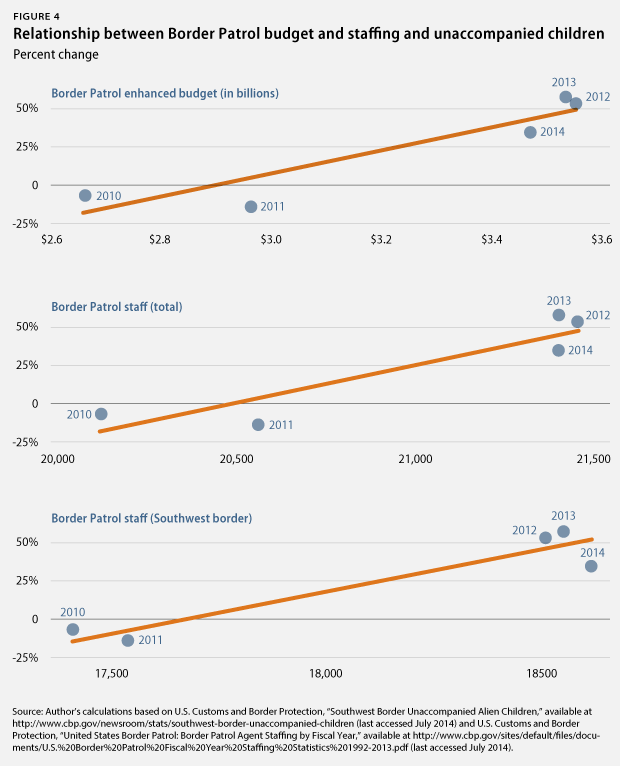 Under the Obama administration, funding for the Border Patrol has reached record levels, increasing from $2.3 billion at the end of the Bush administration in 2008 to $3.5 billion in FY 2013—an increase of 52 percent. To be clear, this should not be interpreted to mean that more border security means more unaccompanied children—again, we only have a handful of observations to analyze. Rather, the data suggest that the recent increase in unaccompanied children is not the result of lax border security, but is occurring despite record levels of border security spending and staffing. And from recent press reports, it is clear that our border security policies are working exactly as intended: Numerous stories note that the Border Patrol is apprehending these kids upon entry, or soon after. 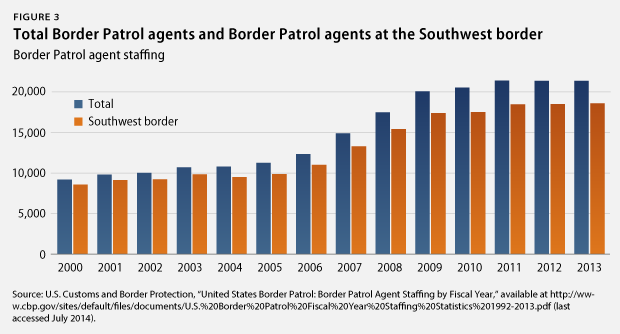 Here too, the evidence is clear that border enforcement policies are not driving the surge in unaccompanied children. Instead of attempting to repeal programs such as DACA, the United States should—as Sen. Robert Menendez (D-NJ) has suggested—ensure that these children are safe and secure, go after the smugglers and traffickers bringing them here in the first place, and seek solutions that help quell the violence in these children’s home countries. The data show that this situation is a humanitarian and refugee issue, not an immigration issue, and all sides must not lose sight of the children themselves who are at the heart of the matter. Tom K. Wong is an assistant professor of political science at the University of California, San Diego.